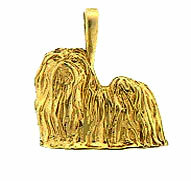 The Maltese have a long, silky coat that is most luxurious. So you had better be mindful for their propensity for playing in mud puddles! The Maltese is bred for companionship. They are lively, gentle, and trusting. Sometimes they can be jealous of your freinds, just as your friends could be of this equally luxurious pendant. Ideal for a necklace, lapel pin, or tie tack.